While McDonald's in many countries is trying (feigning?) to be healthier, in Japan, the fast food chain really doesn't seem to give a crap. If anything, McDonald's is running fast and hard to unhealthy. Super size, Japan! 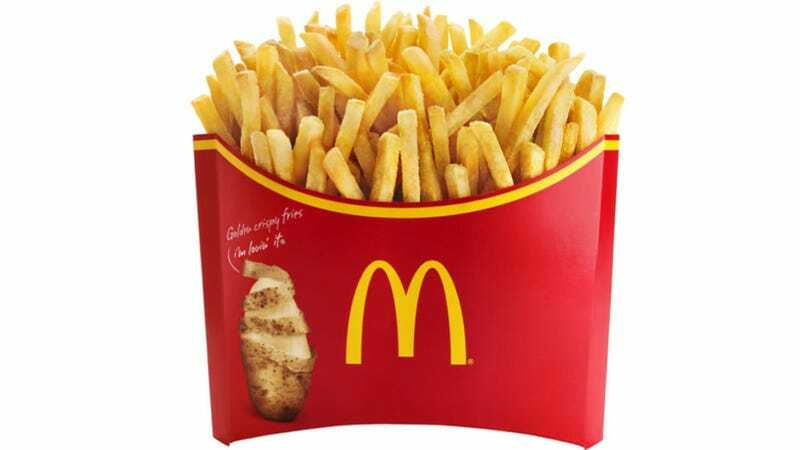 For the past few weeks, there have been rumors that McDonald's Japan is rolling out a huge size for French fries (which actually is replacing another super large size called "Share Potato"). Today, as IT Media reports, it's finally official. Dubbed "Mega Potato", you are looking at two large size fries in one wide friggin' container. Two large fries usually cost around the equivalent of US$6 in Japan. These, however, are priced at 490 yen ($4.80) and will be on sale until late June. But will Mega Potato inspire French fry headaches in Japan?